Anyone else out there tired of all of the rain? Yesterday was a messy Saturnday and it looks like Sunday won't be any different. I guess it's a good thing; you know what they say, the more the rain...actually I don't know what they say, but I'm sure all of the rain is working wonders for the plants and grass which is something we definitely need in California. Speaking of the season, the other day something strange happened. People in the house had the TV on and they were watching, of all things, Shrek The Halls. You're probably wondering what the hell Shrek The Halls even is -- it turns out it's a Christmas movie with the characters from the popular Dreamworks film Shrek. Anyway, I was in my own little zone chatting with a friend online. For some reason I decided to ask him if he liked 80's band Journey (WTF?). Before he could answer their song "Don't Stop Believin" began to play on the movie. I thought that was funny and a little bit weird. It made me actually pay attention to the movie for a minute and I was surprised by what I saw. Oddly enough, this Christmas movie starts in the summer. Shrek seems to be another symbolic representation of the Green Man that is so common in pop culture. The Green Man represents the Egyptian God Osiris. 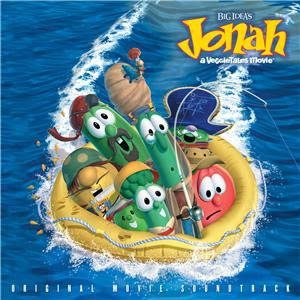 The pop culture representation of this God seems to most commonly be depicted by actor Jim Carrey. Osiris was the God of the Resurrection, the Underworld, and the judge of the dead. 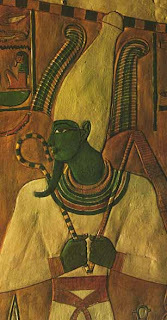 Osiris is also the patron of agriculture which is an important aspect of the film Shrek the Halls and the celebration of Christmas in general. As you can see from the picture above Shrek is enjoying the summer with all of the grass and green around him. As the movie progresses it is revealed that, like the other Green Man the Grinch, Shrek hates Christmas. The story also unfolds in the same manner as the Grinch as the Christmas spirit is raised through the symbol Green Man. The celebration of Christmas can be traced back to the celebration of Saturnalia which predates Christmas. Saturnalia was the celebration of the God Saturn. Like Osiris, Saturn was the god of Agriculture. As winter approached the Romans were losing harvest hence the worship of the Saturn, the God of Agriculture. Saturnalia is rooted in Pagan and Celtic beliefs. 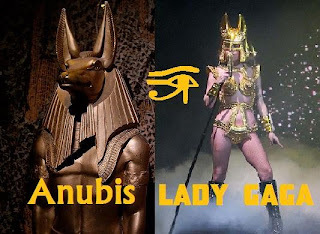 Osiris is also the father of Anubis who I recently linked with pop star Lady Gaga in Gaga for Death Continued. Pop star Madonna represents Goddesses such as, obviously, Mary as well as other Goddesses, most notably Isis as so well explored by Matthew Delooze. I was also surprised to find a reference to Madonna as Isis in this symbolic episode of Hanna Montana. 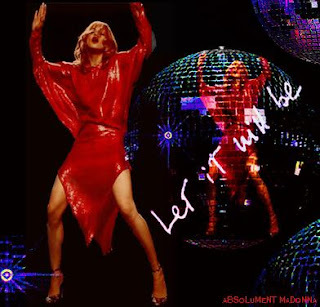 Madonna with Sun God Jesus in "Celebration"
Madonna and Lady Gaga participated in a staged fight on Saturday Night Live. Considering their current symbolic roles and Isis and Anubis, could this fight represent the symbolic battle of the death of the Sun (winter) and rebirth of the Sun through the Mother Goddess? Lady Gaga also seems to reference Sun God Ra in her chant featured in her current single "Bad Romance". There's also references to Roma in "Bad Romance". 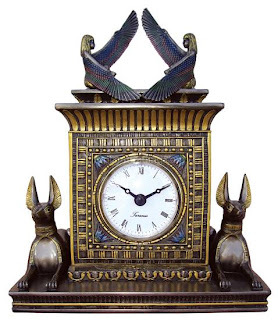 Anubis was a funerary god. His task came to be holding the scales on which the heart was weighed. If the heart was lighter than a feather, the dead would be led by Anubis to Osiris. If heavier, the soul would be destroyed. A friend of mine also struck up a conversation with me about a comic character named Ultra Boy who was the leader of a gang called Emerald Dragons. Upon further exploration I found out that Ultra Boy's real name is Jo Nah and was inspired by the Biblical story of Jo Nah. This was interesting to me as the Jonas Brothers have been on my mind ever since I posted this photo. You can also imagine my surprise when I ran across the following commercial. What I liked about this was Madonna's images because she's an icon actually many other artists have been inspired by this incredible woman. Madonna and Lady Gaga are my favorites pop star ,I want to have the chance of buy some of their albums, lady gaga is really beautiful! Did you know that you can create short urls with AdFly and receive money for every click on your shortened urls.